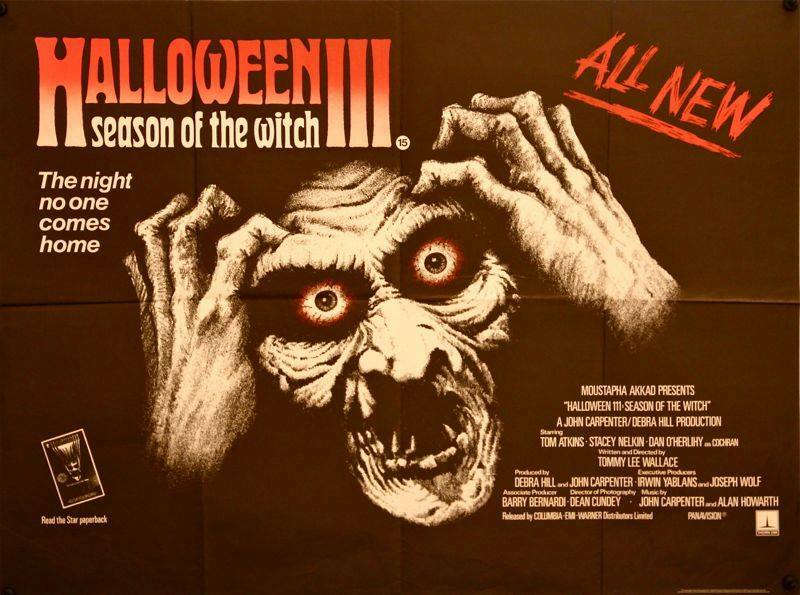 In keeping with the popular social media trend of “Throwback Thursday” (#TBT), we will from time to time take a moment to focus on the classic trailers, posters, and promotional items from some of our favorite Halloween-themed movies, TV shows, and more, continuing today with a flashback viewing of the original theatrical teaser trailer for the controversial sequel Halloween III: Season of the Witch (1982). While the trailer is undeniably creepy and good, it is remarkable how completely misleading it is in regards to what the film is actually about, suggesting (as many moviegoers at the time assumed) that Michael Myers would return to inflict more havoc in Haddonfield, albeit perhaps in a different mask, but of course that was not to be. As with the vintage ad pictured above, the signature witch mask, designed by Don Post, is there, but there’s not even a hint of the Silver Shamrock jingle that would eventually come to be synonymous with this cult favorite. Watch the original teaser trailer for Halloween III: Season of the Witch in the player below, and then give us your thoughts in the comments!